Last week's column mentioned the sculptures inside the Goeglein Gulch roundabout. So what's the deal with those three slabs with faces on them? 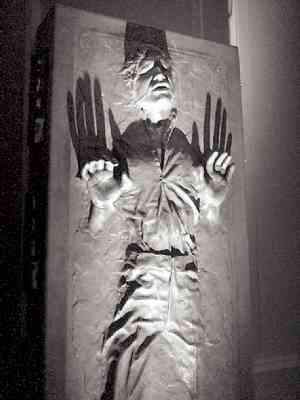 They remind me of Star Wars when Han Solo was frozen in rock. Is the artist a Star Wars fan or what? - SkyRidge DriverWell, now that you mention it, the sculptures at Fort Lewis College's eastern entrance sort of look like they were inspired by the 1980 sci-fi classic, "The Empire Strikes Back." As you'll recall, a long time ago, in a galaxy far, far away, the renegade Han Solo was captured, entombed in "carbonite" and presented to the corpulent Jabba the Hutt as a trophy. But any connection between Star Wars and the roundabout is coincidental. 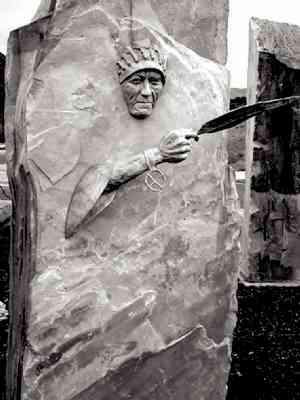 The characters depicted in the middle-of-the-road monoliths are grounded-to-earth Native Americans, not space cowboys. Furthermore, the only "Hutt" in Durango is Pizza, not Jabba. Selected and paid for by Fort Lewis College, the $80,000 roundabout monoliths depict a pointing child, a woman holding a pot and a tribal elder with a feather. The sculptures are collectively called "The Greeters." The installation represents "the full cycle of life and nature," said the artist, Denny Haskew, from his Loveland studio. Haskew's inspiration is the natural world, not a fictional space saga. The artist chuckled when asked if he were a Star Wars fan. "I've seen the films, and they're fun to watch," he said. But an homage to Han Solo? Uh, no. Action Line should point out that Star Wars does indeed inspire some artistic endeavors, but they are pretty much limited to that YouTube kid who pretended he was a Jedi fighter with a broom handle. _____Today is a special Memorial Day edition of the Mea Culpa Mailbag, with observations from Action Line's far-flung correspondents. From Mexico, expatriate Durangoan Dr. John Griffiths, weighs in about the buffoonery surrounding U.S. Highway 160 construction. "The name of the CDOT boondoggle bridge (is) wrong. It isn't a bridge TO nowhere, it's a bridge FROM nowhere," he e-mails from his boat, the Pegasus, lying at San Carlos, Sonora. "It should be absolutely no surprise to anyone that in most cases CDOT does its road-blocking, traffic-stopping, very expensive thing without regard to any average person's plans, wishes or actual needs," he observes. "Part of the problem is that CDOT's planning and design ferrets work in offices. Having highway officials work in offices is about as effective as making all the cops work in offices. "All highway employees should work in RVs that are constantly driving around. We'd see some rational attitudes, practical priorities and workable designs in pretty short order."
? From the San Francisco Bay Area, loyal reader and Action Line's college chum John O. Horsley, offered salient and wise observations about the recent column on KFC's offer to fill potholes and the accompanying photo of Col. Sanders spray-painting asphalt. Horsley expressed concern that Action Line gave short shrift to the memory of "the great Harland David Sanders" and that the column "failed to acknowledge that KFC remains a delicious staple of the American diet." He suggested "consulting the informational resources of the Harland Sanders Café & Museum in Corbin, Ky., the unusually rich and informative Wikipedia entry on Col. Sanders and, of course, the summary of historical milestones presented on the KFC corporate Web site." "Perhaps Action Line could benefit, as I have, from observing Col. Sanders' adage: 'If you've got time to lean, you've got time to clean.' Thank you for your consideration of these points." E-mail questions to actionline@durangoherald.com or mail them to Action Line, The Durango Herald, 1275 Main Ave., Durango, CO 81301. You can request anonymity if the Force is with you.